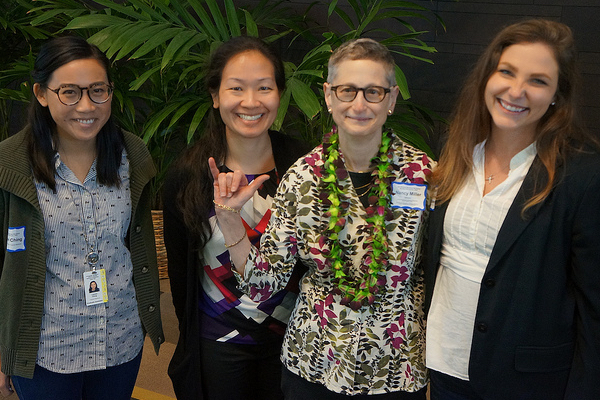 Pictured: When Dr. Miller flashed a shaka, it brought smiles to those posing with her during a break in the workshop. Tina Shelton photo. The University of Hawaiʻi Department of Tropical Medicine, Medical Microbiology and Pharmacology hosted a leading medical scientist from Boston University this week in a day-long Medical Mycology workshop at the Sullivan Center. Nancy S. Miller, Pathologist and Medical Director of Boston Medical Center’s Clinical Microbiology & Molecular Diagnostics, Boston University School of Medicine, was the instructor, with her visit made possible through the John A. Burns School of Medicine (JABSOM) Robert T. Wong, MD Endowed Lectureship. Other sponsors and organizers for the event included the Student Immunization Initiative, ASCLS Hawaiʻi and the American Society for Microbiology, Hawaiʻi Branch. Board-certified in Anatomic and Clinical Pathology, Dr. Nancy S. Miller completed a post-doctoral fellowship in Medical Microbiology at Johns Hopkins prior to becoming an Associate Professor of Pathology & Laboratory Medicine at Boston University (BU) School of Medicine. She currently presides as Medical Director of Clinical Microbiology & Molecular Diagnostics at Boston Medical Center (BMC). Dr. Miller has served as two-term President of the Northeast Branch of the American Society for Microbiology (ASM) and was honored as an ASM Distinguished Lecturer between 2016 and 2018. She participates in working groups defining protocol validation and guidelines for ASM, Centers for Disease Control & Prevention, and the Food and Drug Administration. With collaborators from BU and BMC, Dr. Miller is involved in translational research to improve diagnostics for microbiology and infectious diseases and is a principal investigator for industry-related projects developing and testing new diagnostic devices. The Robert T. Wong, MD Lectureship was created to honor the life of a remarkable physician from Hilo, and to to enhance medical education for Hawaiʻi’s citizens. The lectureship allows nationally and internationally prominent persons involved in the medical field to come to Hawaiʻi and give the University of Hawaiʻi, the medical professions in Hawaiʻi, and other interested persons in the community an awareness of the latest in scientific research and techniques in the medical and health fields. Dr. Robert Wong, an ophthalmologist, practiced medicine in Hilo for 60 years. He was one of 15 children when he was growing up on Hawaiʻi Island. He was born in 1911, the son of a father who had come from China to make a better life in Hawaiʻi. He attended Hilo High School and graduated from the University of Hawaiʻi at Mānoa in 1932. Graduated from the Jefferson School of Medicine at what is now the Thomas Jefferson University Sidney Kimmel Medical College in Philadelphia. He had an extraordinary life. He was attending a lecture when the bombing of Pearl Harbor began on December 7, 1941. He and others found working the next several days right where he was — on the campus of The Queen’s Hospital. After the war, he would care for patients of Hansen’s Disease on Molokaʻi and at Hale Mohalu on Oʻahu. Dr. Wong was an early and vocal supporter of the founding of a medical school at the University of Hawaiʻi. “The primary reason for the existence of this medical school is to maintain a high standard and quality of medical care in the state of Hawaiʻi,” he famously said. His words have been proven true. His two sons followed him in medicine. Dr. Stephen Wong teaches ophthalmology at Temple University and Bradley Wong, who completed his medical residency training at the University of Hawaiʻi is a surgeon in Honolulu, and a retired clinical professor of surgery at JABSOM.